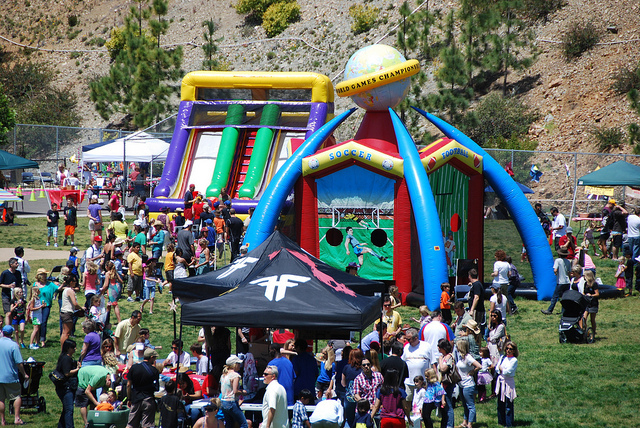 San Elijo Elementary Country Fair is only 3 DAYS AWAY! Yoo Hoo! Have you signed up to Volunteer Yet?? Our vendors Do NOT take cash so you’ll need your tickets in order to buy food, drinks and dessert. Don’t waste time standing in line at the Fair! Buy your family packs all week before and after school! The Family Pack is $55! This includes 25 food tickets and 4 fun cards…Each fun card has 25 punches for rides/attractions/games!!! 4 fun cards = 100 punches!!!! · Bidding begins on Friday, April 17 at 9:30 AM! · Create a watch list of your favorite items and then bid from anywhere, anytime!! · Receive alerts if you’re outbid or use the NEW “Buy Now” option so you don’t miss out on your favorite items!! · Top Gun Experience–Spend the day as a fighter pilot in a military aircraft!! Just remember, your generous support help sustain various SEES education programs at SEES so Thank YOU!! Thank you for helping make this the most amazing Fair EVER!!! To opt out, parents must file a personal belief exemption, or PBE, a signed statement that vaccines are against their personal beliefs. In the 2007-2008 school year, the statewide California PBE rate was 1.56%. By 2013-2014, the most recent year California statistics are available, the rate had jumped to 3.15%. The window is now open through March 27th. Applications are available at the SMUSD District Office – Student Services. The goal of these meetings will be to develop bylaws, organize a board, and move forward on our 501 (c)(3). Enrollment packets will be available at San Elijo Elementary and Discovery Elementary. Please indicate that you are in the Double Peak attendance boundary. If you are applying for an intra-district transfer, you must enroll at your home school. Students who are currently at San Elijo Elementary, Discovery Elementary, Woodland Park Middle School, and San Elijo Middle School and are in the Double Peak attendance area will not need to enroll for Double Peak. All paperwork will be transferred from the current school. You will be receiving a letter in the mail in March with more information. If you currently have a 4th, 6th, or 7th grader at San Elijo Elementary, Discovery Elementary, Woodland Park Middle School, or San Elijo Middle School (and are zoned for Double Peak) and are planning on exercising the grandfathering policy to stay at your current school, you must complete an intra-district transfer form at the SMUSD District Office. This will be an interactive meeting starting the process of developing our vision and core values. Please join Steve Baum, principal of Double Peak School, for a cup of coffee and an informal meeting. He will provide a brief update on the new K8 school and then be available to answer question. This informal setting is a wonderful way to support our local businesses, get to know our new principal and meet the parents that will be attending Double Peak School. Mr. Baum will be visiting Discovery Elementary, San Elijo Elementary, Woodland Park Middle, and San Elijo Middle during the upcoming months. These meetings will build excitement for the new school and allow students to assist in the decision making process. If you would like your child to participate in these meetings, please use the link below to fill out the survey. Both students in the Double Peak boundary and possible intra-district transfer students are welcome to participate. This is a wonderful way for the students to take part in the development of the school culture. Steve Baum introduced himself as the new principal of Double Peak K-8 school. He felt it was important for us to know a little about himself in order to build this relationship together. He is homegrown from San Marcos near Woodland Park. He graduated from San Marcos High School and then from University of San Diego with the desire to be a physical therapist. He then realized he wanted to be a coach and in order to coach at a school you have to be a teacher. Once he was in the classroom as a teacher in Science at San Marcos High School; he realized how much he loved teaching and engaging with the students. At that moment his desires shifted. Coaching sports was no longer a priority. Teaching in the classroom was something he got excited about. He has been pursuing his career in education within the San Marcos School District ever since. He was the Principal at Knob Hill Elementary and Twin Oaks Elementary. Now he is onto his next journey. He will be Principal of the only K-8 school in the district. He views his new position as an honor and is very engaged and excited to open a brand new school. He feels this is an opportunity of a life time. The school is built for 1200 students and a max of 1500 students based on the community growth. He anticipates the enrollment numbers to reflect the following: Approximately 800 students K-5th Grade and 400 students 6th-8th Grade. He prefers to start the school year with closer to 1000 students. He wants the energy of the kids, parents and teachers. He has been actively planning from day one. He has developed many focus groups with elementary and middle schools in the district. He wants to learn and acquire as much feedback as possible in order build a school that can be effective, and meets the needs of all individuals at the K-8 School. During this process he will be trying to expect the unexpected. This will be an on going challenge for him. He has met with food services; recognizing the food offered to the students will be different depending on the age of the student. He met with the PE teachers discussing the design of the gym and locker room. He is meeting with other principals, teachers, students and parents. He truly believes collaboration is one of the keys to success. He wants a community feel at the school. Therefore there will only be one central front entrance into the school. This creates an opportunity to bring the students together. When designing the buildings and the use of space.. he tried to provide an ocean view to everyone where possible. The Start and End times for the school has not yet been determined. He would like for all students to start at the same time. He thinks it’s an important way to connect with each other. However the end times may not be the same. Middle school is required to go to school less hours than Elementary School students. Kindergarten will be 1/2 day similar to the other schools in the district. The buildings will be color coded so the students can find their classes easier. A color inside will reflect the same color scheme outside. The Library will be designed to accommodate all ages. There will be a carved out separated area just for K-5th grade. Then a section designed to meet the needs of a middle school student. The Innovation Room will be a room inside the Library. It will be behind sliding glass window doors. You open the doors and it is designed like a ” Google Think Tank” it will have bright colors on the walls, different types of furniture to sit on. One wall will be one big complete White Board. A projected screen will come down and the students will be able to communicate and connect with for example; San Marcos High school, Cal State San Marcos University. This is a room to create, design and be Innovative!! The Multipurpose Room will not only hold meetings for parents or school assemblies. It will be designed to optimize the sound of beautiful music. There will be a floating ceiling to optimize the acoustics. The stage will be bigger with a projected screen and a big purple curtain to complete the experience. The Gym will be designed for all types of sports to be played. The Middle School students will change classes during the day. The K-5th Grade will have KOC on campus and he is considering providing after school activities for Middle School students too. WHO IS GOING TO DOUBLE PEAK SCHOOL? Many comments were made about the concern for where will the students go to High School? It’s recommended to look at the school boundary list to determine based on where you live how it will affect which high school. Collaboration -It’s about the parents, teachers, students and school. His philosophies begin with a few key books. This is where he gets his inspiration. There are many valuable gems of information from these books to explore; however here is a sneak peak. The idea that success is linked to opportunity. Right place at the right time. Access to resources. Success requires effort, hard work and the experience to celebrate the success. Success is a student being responsible for themselves. All students will have access to these unique opportunities starting in Kindergarten. These skills will build upon each other creating a K-8 articulated experience. Charlie McGee will be the Music Director and he came from San Elijo Middle School. They will hire a K-8 Music teacher. There will be music appreciation, band, and grade level music performances. At this point the music program is focused on instrumental. The school’s focus will not be a performing arts school. They will have a visual and comprehensive art curriculum; a pathway from K-8th grade. They will have curriculum focusing on Engineering, Coding, and Robotics. Their was a teacher informational meeting and 107 teachers expressed interest in learning more about the school and the possibility of working as a teacher. The interactions will be in a structured organized manner. A Buddy Program and Leadership Program will be established. Unstructured ways would be passing each other on campus. They are planning for separate bathrooms for Elementary students and Middle School students. There is a designed division on campus to delineate the kindergarten, elementary, and middle school students. What about the course offerings? Middle Schoolers will receive the same electives as the other middle schools in the district. The variety of electives may be modified based on the school’s focus. The level of the elective can shift due to the student’s knowledge base. There is a detailed chart identifying if your child is in x grade now, then what school will your child go to next year. If grandfathered into a school; you must complete the form even if your child wants to stay in their current school. Please be sure to confirm this information with the school district. This chart will be in the powerpoint presentation from this meeting. When should people who live in the new school boundary start to enroll? This process is still not clearly defined and they are working out the details and timeline. Will busing be an option at this school? Busing is being considered, but funding is a limitation. Will there be shade for the students on the play ground or on campus? He is currently thinking and discussing the possibility of shade for the students. There will be multiple lanes to pull into the school. It will have a drive up option and two parking lots. One for every day use and an overflow lot. A well defined design is laid out and the district is optimistic. However there is no perfect parking/traffic experience for drop off and pick up at any school. There will be a stretch of road on Twin Oaks where it will be widened so parents can turn into the school. The speed limits will decrease on Twin Oaks at certain areas due to the school. A defined safety plan will be put in place. He will meet with fire and sheriff to ensure it is effective and supported by the first responders in the event of an emergency. This is the same for any other school in the district. The next Parent Informational Meeting is Monday, September 29th at 6pm at North County Regional Education Center (SMUSD’s District Office) at 255 Pico Ave. The PowerPoint Presentation from the 9/25 meeting will be posted on Tuesday September 30th on the Double Peak School website for your review. Further questions and/or if wanting to provide feedback to Mr. Baum; please email him at steve.baum@smusd.org or call at 760-290-2344. In addition, the Double Peak School website has a section for frequently asked questions and on that page you can submit any questions you have. If you go to your child’s school website of the four schools that are affected; you will see an icon for “Double Peak School” on the front page. It will have updated information about the new K-8 school. If you are a new family to SEES, please join SEES staff on the SEES Campus from 4:30-5:30pm on Monday, August 18th. Still need a backpack or lunchbox??? 20-30% of your order goes back to SEES PTO at STNDRDBAGS.COM. Log on and check out all the good stuff! Also free shipping with code SHIPSEH For more information, please click here for the flyer! On Friday, August 22nd, class lists will be posted in front of the school at 4:00pm. You will be able to see what teacher your child has for the 2014-2015 school year. Please join the SEES PTO Monday, August 18th at 6:00pm for our first PTO meeting for the 2014-2015 school year. We would love to see some new faces and you can check out what goes on behind all the PTO events. The meeting will be in the SEES library. STNDRD Bags has partnered up with San Elijo Elementary again this year to help raise money for our school. With every purchase you make 20-30% of the sale will go back to SEES. STNDRD bags carries backpacks, water bottles and lunch boxes from some of your favorite brands like DC, Volcom, Dekine and many more. They are a local company and the owners are parents at SEES. Receive free shipping on your order, use promo code “SHIPSEH” when checking out.